So how’s YOUR Reunion Dinner come this roaring, bawling and ferocious year of the Tiger?! For the past few years, we’ve NOT been having home-cooked meals for more reasons than one (the tiresome preparations, cleaning on top of the annual spring cleaning, and of course, the escalated prices of the fresh goods from the market), and instead have opted for meals in restaurants; ranging from a diverse range of Chinese diners (such as Kok Thai in Ipoh Garden East, Han City, Mun Choong), to Western outlets such as Secret Recipe, and even fast food options such as KFC and Pizza Hut. Yeah ….. my family is NOT your typical idea of a most traditional (Read : stubborn) one, for even my grandma enjoys her piece of fried chicken more than a piece of steamed chicken. For this year, we had our annual gathering at Delight Seafood Restaurant, for surprise, surprise! All the other alternatives have been fully booked, 2 weeks before the date! No, of course not the Western counterparts, but the Chinese diners in Ipoh. 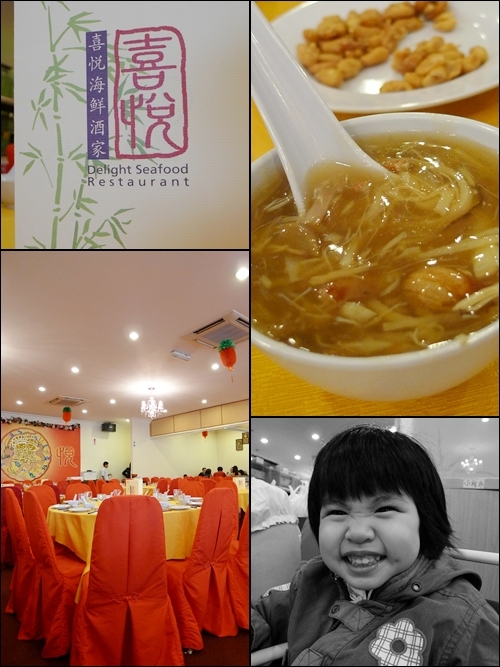 And of course, we did hear rave reviews about Delight Seafood Restaurant from some other foodies. But seriously, the last time I dined here, back in 2008 when I was still blogging at my old blog, the meal was satisfactory, yet it cost a BOMB! But of course, their ingenious pairing of the East and the West was spot-on, with delectable items such as grilled pork ribs and lamb ribs on the menu. You can of course, read my review back then at Food Street. The “Eight Treasures & Sliced Chicken Bisque” (resembling a hearty bowl of shark’s fins, without the unnecessary killings of the poor sharks), the resplendent dining ambience, and a most jovial Jo-Ey, my dear niece. The set for 10 pax was priced at RM388/USD110 nett. 8 dishes, including the compulsory platter of Yee Sang. The restaurant was packed since 6.30pm, right up until 9pm+, when we alighted from our chairs. Service was satisfactory, and very attentive. Sans a few mishaps in the sense that they forgot to top up our glasses of Chinese tea. Minor gripe though, for the ratio of staff to customers was probably in the realms of 1:2 tables. The meal sadly, was not up to mark. Bordering on mediocrity, and some dishes even overcooked (the chicken was tough, and dry), while the others lacking in flavours (the rice with cured meat). The Tom Yam Prawns were good, in the sense that the prawns were fresh and succulent. Not so much because of the slightly ambiguous gravy (I only knew it was Tom Yam, AFTER I finished my meal and read the brochure!). 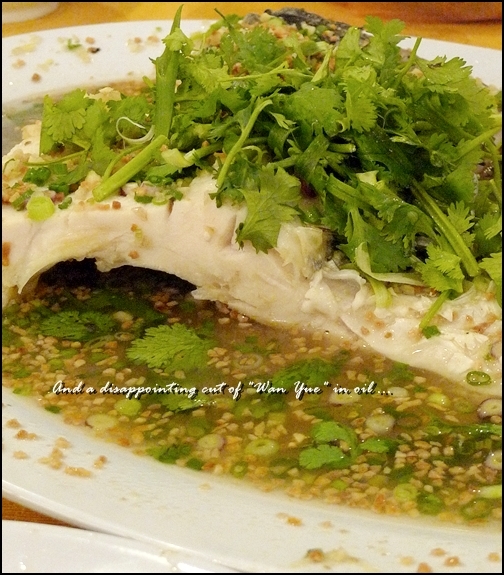 The Steamed Grass Fish (Wan Yue in Cantonese) with Ginger Mashed was a mess, as the whole cut of fish was swimming in the oil. And to add salt to the wound, the fish was reeking of muddy taste. Though in some ways, the mashed ginger and fried garlic combination was a potent one, paired with lots of chopped coriander, the sauce made great pairing with the rice. 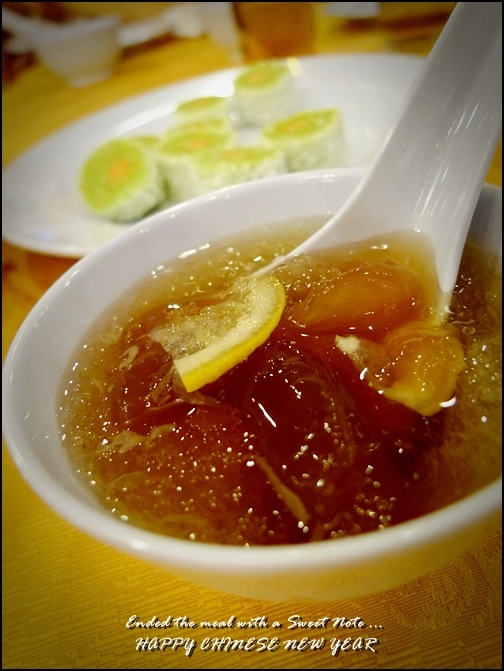 The Honey Palm Fruit (Honey Sea Coconut) with Lemon was a most generic dessert, but the accompanying jade green rolls of sticky mochi-like creation was addictive. Telephone : 605-249 7117, 249 7118, 249 7119. Here’s a GOOGLE MAP to the restaurant. This restaurant is situated on the same row with Ipoh City Hotel, Pusing Public Restaurant, and behind The Store (previously Ocean) on Jalan Dato Onn Jaafar. 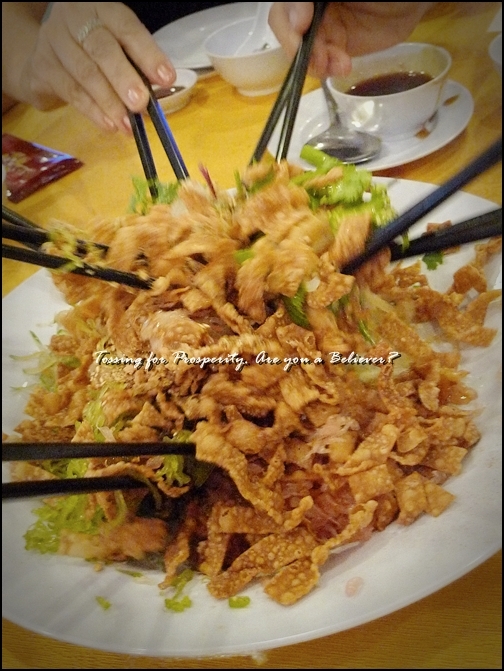 This is the 1st time I saw so many fritters in a yee sang dish. Goodness. Haha the fish not so vivid then was it? I agree with the concept of doing away with the hassle of preparing the reunion meal but in the past, we’ve been disappointed time and again by generally subpar meals at otherwise perfectly serviceable joints. We’ve gone back to eating in recent years and next year, I’m planning to skip CNY altogether! Hope your holiday’s coming along nicely! Haha… Luckily you had good company or it looks like the rating for this restaurant would have been really bad! Hope you and your loved ones will be blessed with happiness, prosperity and good health in the year of the tiger and all the years that follow! we had our reunion dinner at Oversea restaurant in Ipoh, there were some service problem and I notice this CNY a lot of foreign workers were not around, was old they left early! food was ok, I was caught with delight of their Tai Ji duck, it was very good! 🙂 Happy Holidays this CNY! CNY season is like that. sometimes they just not enough people. Hmmm …. CNY sure those restaurant fully packed. 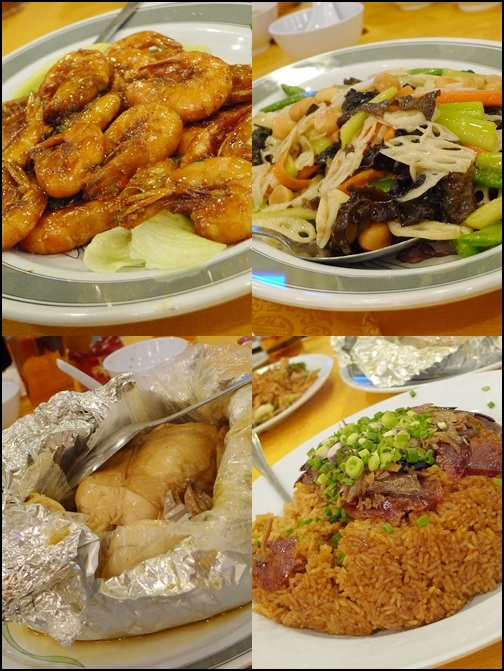 The food quality came down too …..
Ipoh never have problem in finding food during the CNY eve, but Penang does. But lately Penang has quite a few restaurants open for the eve biz now. Seriously the food quality is so bad now that I don’t even have the mood to blog about it. Gong Xi Fa Cai! It’s the first time ever that I celebrated my CNY away in a honeymoon! 🙂 I missed reunion dinner! But our family is still traditional and stubborn, you might put it, but my grandma is a super awesome cook! James, for that price, it is considered cheap..hahaa… the one i took cost 428rm, i guess most are “making profits” during these 15 days.. after which, they will take some days off to enjoy..